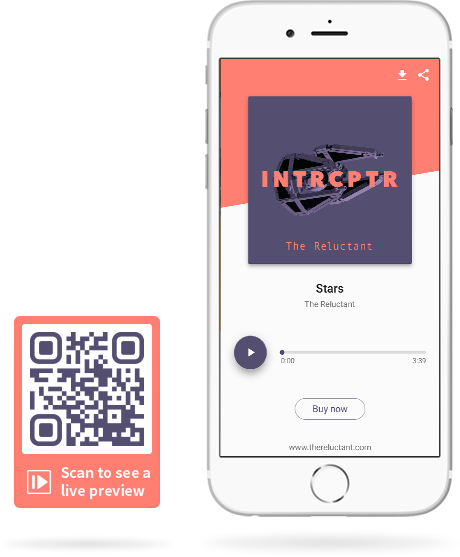 Get the MP3 QR Code to play a song, podcast, audio book or tutorial. It comes with a customizable mobile-friendly page for your artwork and a short description of your recording. An optional download button makes it easy for customers to save your MP3 file to their device. Customize a button to link to your website or purchase your work on iTunes, Google Play Music, Amazon Music, and more. To share, use the QR Code or short URL for print and online ads. When I introduced my MP3 QR Code to the office, we were amazed in no time. Customization let us capture our corporate look, as if we developed the page by ourselves. Find out everything you need to know about the MP3 Code from how to create it to advertising your QR Code and short URL. Need some inspiration? Check out these clever ways to advertise your MP3 QR Code.